A central theme of this blog is that the economy is still starved of the monetary assets needed to restore full employment. That is, the ongoing shortfall of aggregate demand is at its core caused by a shortage of money and money-like assets relative to the demand for them. The question, then, is what can be done about this problem. 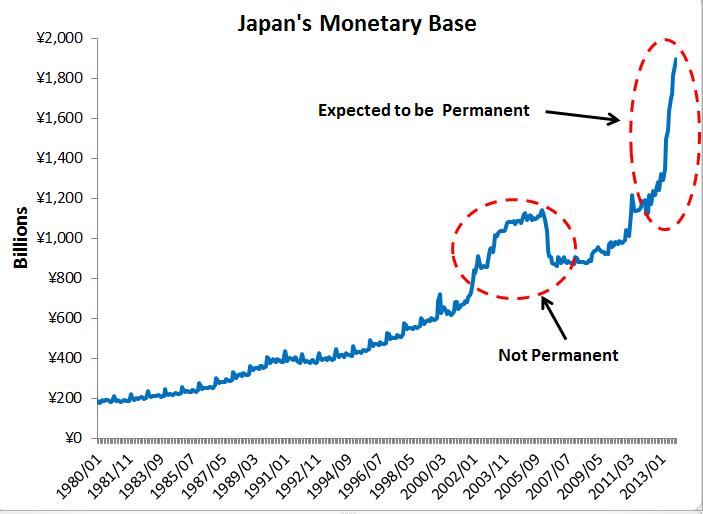 The key to the above story is that some portion of the monetary base expansion is expected to be permanent. If the public believes the Fed's asset purchases are not going to be permanent and therefore the price level and nominal income will not be permanently higher, the rebalancing will not take place. I bring this up because this same point applies to helicopter drops or any other kind of fiscal policy stimulus. Yet many of my fiscalist friends miss it. 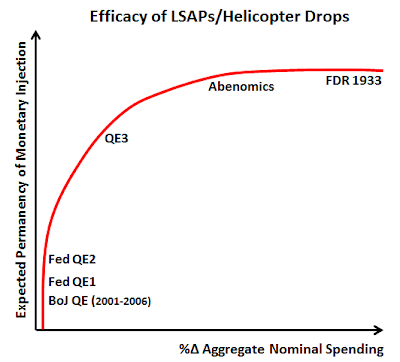 They seem to think that helicopter drop will solve the excess money demand problem, period. That is not the case if the Fed continues to hit its inflation target. Imagine, for example, that Congress approved a $10,000 check be sent to every household. Even in a non-Ricardian world where households are liquidity- and credit-constrained, the increased private sector spending created by the checks would be offset by monetary policy if it started to push inflation above its target. This is why helicopter drops by themselves are not a fix. Nor or large scale asset purchases. As noted by Christina Romer, there has to be a regime change in how monetary policy is conducted, one that signals a commitment to a permanent expansion of the monetary base (via a commitment to a higher price level and nominal income). From this perspective, it does not matter whether one does helicopter drops or large scale asset purchases. They would have the same effect if tied to the same target, such as a NGDP level target. The effects could be different if, in practice, the consequences for future policy were not perceived the same way by the public. Under quantitative easing, people might not expect the increase in the monetary base to be permanent – after all, it was not in the case of Japan’s quantitative easing policy in the period 2001-2006, and US and UK policymakers insist that the expansions of those central banks’ balance sheets won’t be permanent, either – and in that case, there is no reason for demand to increase. In other words, we should not be surprised that the Fed's QE programs have not packed more of a punch. U.S. monetary authorities have clearly indicated the programs are temporary. (QE3, though, has added some permanency with its data-dependent nature and appears to have offset much of the 2013 fiscal drag.) 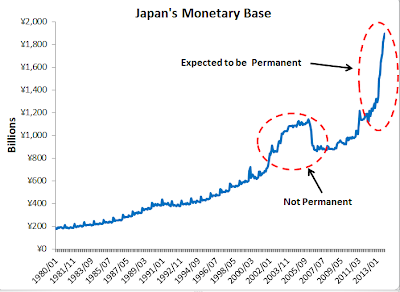 We should also, then, not be surprised that Abenomics--which has signaled a permanent expansion of the monetary base--is doing so much better than the original Bank of Japan QE program of 2001-2006. Finally, we should also not be surprised as to why FDR's 1933 decision to go off the gold packed such a punch. 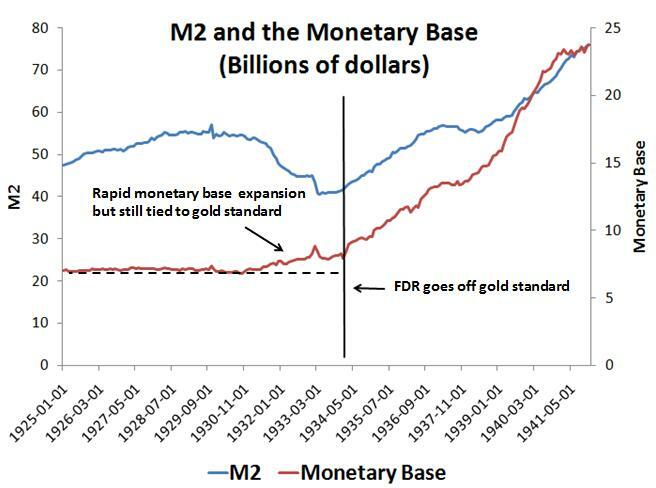 It permanently raised the monetary base. All of these experiences paint a picture of the relationship between the expected permanency of monetary base injections and aggregate demand growth. This relationship is sketched in the figure above. So stop worrying about whether large scale asset purchases or helicopter drops are more effective. This is the wrong debate. Instead, start worrying about how we can change the Fed's target to something like a NGDP level target. P.S. Paul Krugman's 1988 article also implies that the temporary versus permanent distinction is important in determining the efficacy of monetary policy, particularly at the ZLB. P.P.S. The above discussion is why I have previously argued for helicopter drops to be tied to NGDP level targets. Update: Compare this picture of Japan's monetary base to those of the U.S. monetary base in 1933. Excellent blogging. Currently, under law, the Fed can hold bonds to maturity, but then must extinguish the cash received at maturity (or when they sell bonds). So that is not a permanent monetary expansion. The Fed can, of course, roll-over on the debt. They would have to tell the market that is their plan, and then buy debt to replace the debt that has matured. I am surprised there is not more discussion about this topic. Of course, this scenario assumes the Fed chooses to stimulate. The Fed is independent, and has powerful internal organizational norms. One could say they have an exalted mission statement, and "fighting inflation" is higher in that statement, than "fomenting growth." The Fed has been adding economists to its staff (and at regional banks also) for decades. It employs more monetary thinkers than any other organization on the planet, and often has ties to those its does not employ. Despite (or because of) that, Market Monetarism evolved outside of the Fed. My guess is the Fed will copy the BoJ. Sort of BoJ-lite. Not monetary asphyxiation, but tonight enough to keep the economy blue in the face. Allowing central bankers to determine monetary policy is like having agoraphobes design elevators. You are going to get some odd results. Early on in the financial crisis, Australia posted $A900 cheques to every taxpayer earning less than $100K and a further $950 for each school age child. May I suggest a review of evidence as how it impacted the Australian economy may be a useful investment of time? May I suggest that it was the RBA and its expected path for monetary policy that allowed those cheques to matter? The question: Why does a commitment to steady NGDP growth also imply a commitment that the monetary base will be permanently higher ? Surely that depsend upon future demand to hold money ? If a future economic recovery leads to a lowering of this then will not the monetary base be redcuced by a NGDP-targeting regime to avoid an over-shoot. The comment: I think that many "fiscalists" would accept that CB actions could neutralize helicopter drops. That is not the reason they favor such fiscal actions over QE. I think it is rather that they see that such policies will have a more direct effect on NGDP growth than monetary policy. At the zero-bound CB action can probably quash fiscal stimulus but can it generate as much "bang for the buck" ? Yes, the demand demand to hold base money is an important part of the story. So the more precise statement I should have said is that a NGDPLT implies a a commitment to permanently raise the amount of monetary base, if needed. 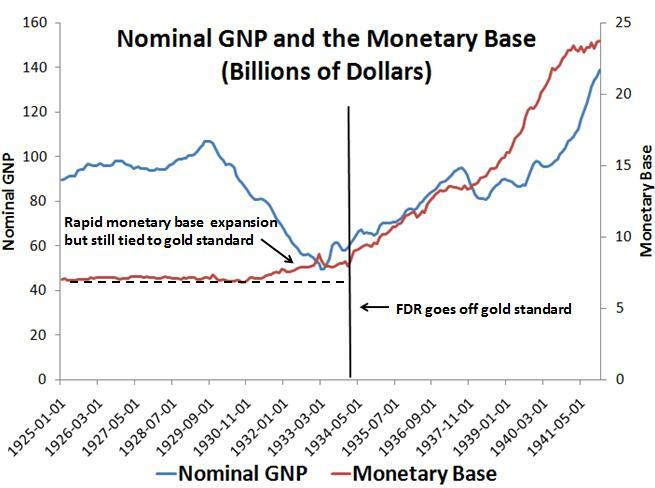 That is, it creates the expectation that if the market itself does not self correct through a higher velocity of base money, then the Fed will keep amount of monetary base higher as needed to hit higher level of NGDP. One of the arguments for a NGDPLT is that it will catalyze a self correction. But even if doesn't, then the target commits policymakers to the permanent expansion. On your second question, the answer is again it depends on the expected permanency as outlined above. Japan's large budget deficits over the past decade can be thought as a kind of helicopter drop and they failed to gain traction. The reason is that it has been understood the Bank of Japan would prevent inflation from rising. Only now with the new commitment to a higher inflation rate (i.e. monetary regime change) do we see progress. “So the more precise statement I should have said is that a NGDPLT implies a commitment to permanently raise the amount of monetary base, if needed.” Hurray. Brilliant. That’s pure MMT. I.e. MMT says that given excess unemployment, the government / central bank machine should print and spend money (and/or cut taxes). Second, it should continue doing that till unemployment hits NAIRU. Third, if the private sector goes into too much of an irrational exuberance mode, the “machine” should do the opposite, i.e. raise taxes and WITHDRAW helicopter money. "increase financial intermediation, spur more investment spending, and ultimately catalyze a robust recovery in aggregate demand." Can you speak more to the knock-on effects of portfolio rebalancing to the real world beyond elevated asset prices? And why a more permanent view of monetary assets would have a more pronounced effect than the current state? Asset prices have been greatly inflated (maybe not permanently) because of current policy, risk premiums have been lowered, but I don't see banks lending much more agressively or businesses investing heavily. I'm not sure how much asset inflation has meant/done for the average joe who is income dependent. How does a permanent LSAP/helicopter drop change the transmission mechanism? Honest curiosity...much enjoy your posts. Thanks. I don't see asset prices overall as over inflated. I do see higher corporate profits behind higher asset prices, but I think that has little do with monetary policy. The reason a permanent increase matters is because it permanently shifts nominal income and the price level. And this matters for several reasons. One, since many contracts are done in nominal terms. For example, someone who took out a thirty year mortgages before the bust had done so with certain expectations of nominal income growth over the next thirty years. The recession has permanently changed that. A nominal GDP level target would correct that, put nominal income back on its projected path and reduce real debt burdens. Another reason, is that the higher future nominal income growth means higher future sales. Firms will want to do more investment spending which implies more borrowing by them. It also means households would be more confident about future income growth and on the margin start borrowing too. This increased demand for loans would lead to more inside money creation and solve the money shortage. "I do see higher corporate profits behind higher asset prices, but I think that has little do with monetary policy." The Tobin Q Channel of the Monetary Transmission Mechanism (MTM) suggests that monetary policy can raise stock prices which in turn can increase investment. In turn the Kalecki Profit Equation suggests that investment can be a causal force in driving profits.All of this together implies that causality can at times be the opposite of that which is thought conventionally. In the case of the US since December 2008, I find that there is bidirectional Granger causality between the S&P 500 and 5-year inflation expectations as measured by TIPS at the 1% significance level, that the S&P 500 Granger causes the PCEPI at the 5% significance level, that inflation expectations Granger causes Nondefense Capital Goods Excluding Aircraft Industries (ANXAVS) spending at the 5% significance level, and finally that the monetary base Granger causes inflation expectations, the S&P 500 and the PCEPI at the 1%, 5% and 10% significance levels respectively. This in turn ties in with David Glasner's research showing a correlation between inflation expectations and the S&P 500. Just to add nuance, I don't find any evidence that the QE in the UK is having an effect on the stock market. Furthermore I have international estimates of after tax corporate profits consistent with the US (NIPA) measures which show that corporate profits in Spain are at record levels and have increased by more than the international average in Ireland, Italy and Portugal since 2008. None of that can be attributed to expansionary monetary policy. Proponents of NGDP targeting have never been able to explain what happens if the median nominal wage fails to increase. It's very possible that all the benefits of an increase in the NGDP will accrue to the top 20% of households in the US, which will result in more inequality than we have today. Many proponents of NGDP such as Scott Sumner prefer a NGDP per capita target or a nominal wage target. A NGDP target is a compromise. The question of inequality is more a cosmic and moral one than an economic one. The DISTRIBUTION of consumption/spending is far less macroeconomically significant than the quantity of it-- the area under that curve. There's a lot that can hide behind a simplistic figure like median nominal wage, I think it would be a poor metric to choose. The President's choice to flood our country with cheap (illegal) immigrant labor will almost certainly depressed median nominal wages, but total AD will not likely be affected. Policy decisions based on that MNW are almost certain to be poorly made. David, I think it would be more edifying to put %change of net financial assets held by the non-banking sector on the vertical axis. What drives increases in nominal spending is a marginal increase in the exchange of financial assets for goods and services. Money is just the intermediary instrument used to effect this exchange. Once you understand this, then it's easy to understand monetary policy by looking at what effect is has on inducing the non-banking sector to exchange financial assets for goods and services (thereby increasing nominal spending). A few comments in this regard. 1. If the Fed bids up the real price (lower nominal rate or higher expected inflation) of financial assets, it will cause a marginal increase in the exchange of financial assets for goods and services. 2. If the Fed raises NGDP expectations, the non-banking sector will exchange more financial assets for goods and services even if there is no change or decrease in the real price of financial assets. 3. If the Fed raises NGDP expectations, it reduces the risk on various financial assets and will cause banks to be willing to purchase these assets at higher real prices (lower real rates). 4. If the Fed exchanges money for financial assets it will have no effect on the amount of financial assets exchanged for goods and services by the non-banking sector unless the market expects that the banking sector will at some point in the future exchange the money for assets with the non-banking sector. Note - When I talk about the non-banking sector exchanging assets, I mean it in the broadest sense not just for example the exchange of securities held in a portfolio but also the issuance of commercial paper, draw downs on a line of credit, note/bond issuance, increased card card balances, taking out a home equity loan, etc. I agree with your points on the increased financial intermediation and inside money creation being a transmission mechanism. It was implicit in my discussion above. If you look at the links over the right side under the safe asset category, you will see I have written similar post. Also really like your introducing the concept of "IOR sterlization" by analogy with Forex market operations sterlization. One could also argue that the concept of 'permanent’ could be defined in a different way. What is it that people want really? They want more liquid assets in the CURRENT state of the world. Maybe they're worried about the future... But if there is a shift to a world of full employment and growth, they may want to rebalance (raise) their consumption/saving ratio, demanding less liquid assets. So the increase in liquid assets need not be 'permanent': it need to be permanent ‘until things change’. Now I don't know if in order to change you need actual inflation to materialize or not - we could argue about that, sure it would help -; but if you assume not, then the increase in M could be fully temporary. What is needed is a 'regime change' that credibly ensures a higher and permanent level of AD and employment; and a central bank that is ready to do 'whatever it takes' (increase liquidity) to ensure/allow full employment. Yes, really it comes down to a central bank being willing to do whatever it takes or simply a regime change. And as I noted in a reply to comment above, the permanency of the base injection is conditional on it being needed. That is, a credible commitment to doing whatever it takes might create a self-fulfilling prophecy by raising the velocity of base money. In that case, there might not be much need for a permanent base injection. But the CB must be committed to doing so, if needed, in order for the self-fulfilling prophecy to work and raise base velocity. If the Fed succeeds, the prob. of the base increase being permanent is near zero. If the Fed fails, the prob. of it being permanent is near 1. Faced with these conditional probabilities, what should be my expectation of the Fed's success or failure? Wouldn't it be independent of the expected size of the base? This analysis is simply wrong. Why can't the smart people in this discussion understand their errors? I'm in the Krugman camp, although I would say that I could most definitely use $10,000 check from wherever.